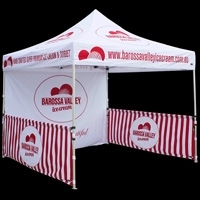 We have dozens of customisation options for our range of commercial grade, printed marquee tents and promotional event tents. With some of those options including custom windows, wall arrangements, awnings, banner mountings and your choice of material finishes such as oxford polyester or waterproof nylon. 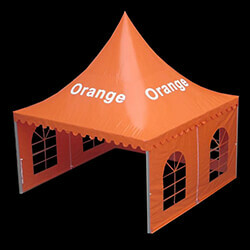 Our branded marquees are second to none in terms of quality. We are capable of producing exactly what you need for your event, faster, better quality and at the lowest price in Australia, guaranteed! Trade shows and industry exhibitions offer a highly effective way to reach out to consumers and other businesses that are genuinely interested in what your company has to offer. 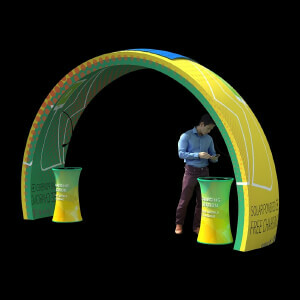 Whilst Internet marketing and other multimedia advertising channels may provide a cost effective way to reach large numbers of people in a short space of time, a well-designed exhibition stand will enable your organisation to pursue a more focused approach to marketing its products and services. Attendees at shows and exhibitions have already demonstrated their interest in the market sector being promoted by turning up in the first place, which means that exhibitors can concentrate on emphasising what makes their company’s offerings unique and on convincing prospective customers that their products and services are the best available. Once you have identified the most suitable shows and trade events at which your company can exhibit, the next task is to source all of the individual components needed to create a display that will really help your firm to stand out from the competition. Because we manufacture many of the products that we supply, you can buy promotional marquees, banners and easy up walls from us at amazingly cheap prices without having to compromise on quality. our folding marquees and banner stands, printed with highest quality graphics, will ensure that potential customers form a good impression of your organisation and because they are made from durable materials, they will provide your firm with many years of service. What type of stand should you buy? The best type of stand to use will depend on the nature of the event at which your company is exhibiting and what type of image you are trying to project. 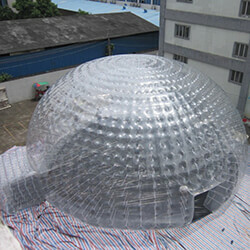 Among the products that we can supply are 6 side marquees, custom star, inflatable and classic aluminium frame marquees. 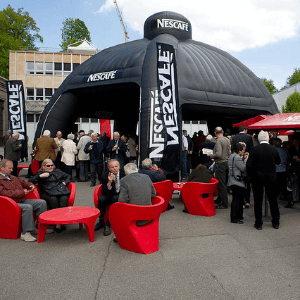 Whatever style you choose, your branded tent can be printed with your company name and logo on either a white or full coloured background, along with any other images and messages that you may desire. The end result will be a professional looking stand that can be embellished in any way that you wish, perhaps with promotional bunting or pull up banners also supplied by us. The 3m x 3m and 3m x 6m Quality Marquees: Featuring sublimation printing, 40mm premium aluminium frame, complete with carry bag. 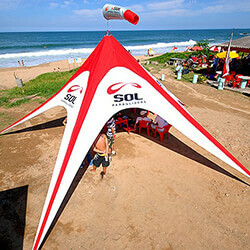 Printed Star Tents: A simple, large material section, designed to accept two heavy duty poles. The material section featured full colour printing. Temporary structures: While our range shown doesn't display as custom branded, we do offer printing on these huge, quality marquees. 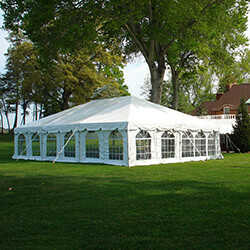 Yes, we do supply marquees and event display solutions. And we are experts in these products with our own manufacturing facility, our own quality control department and some of the most advanced printing machinery available. But did you know we also supply one of Australia's biggest ranges of promotional items, meaning we can supply you with a complete marketing solution for your next trade show. Uniforms, giveaways, corporate gifts. We can supply all of it on demand and offer you special wholesale rates on your order along with a completely free design service which will craft your entire branding image absolutely free of charge. 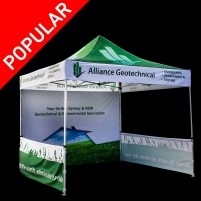 No other company in Australia can offer such a comprehensive promotional solution. An effective exhibition stand should feature carefully coordinated colours and marketing messages. By allowing us to supply you with banners, flags and signs featuring your corporate logo, in addition to high quality promotional tents printed with the same graphics, you can make sure that your stand will attract attention for all the right reasons. We have a great deal of experience manufacturing custom products for our clients and would be more than happy to use our knowledge and expertise to help you make a great impression. If you would like to know how long it will take us to manufacture and deliver the products that you require, please call and we will be happy to discuss the details of your order. We are also more than happy to provide accurate quotations on request. Don't forget we deliver, Australia wide and offer 100% free artwork and design service using our highly skilled team of graphic designers and marketing people to help you get the perfect printed marquees for your next outdoor event!